Knit the best wrister pattern EVER! Home » Red Heart » Knit the best wrister pattern EVER! In yesterday’s post, we talked about yarn weights, today we’re going to put that knowledge to work with Red Heart’sSleek Striped Wristers pattern. Wristers are one of my favorite things to knit! They can be used on their own or in tandem with a heavier mitten for those really cold days. Plus, they cover the space between your mitten and coat; no more cold breezes! I love the play between the colors Dolphin and Pool! This is definitely my color palette. This is a very easy pattern that’s perfect if you’re thinking about attempting something made in the round. 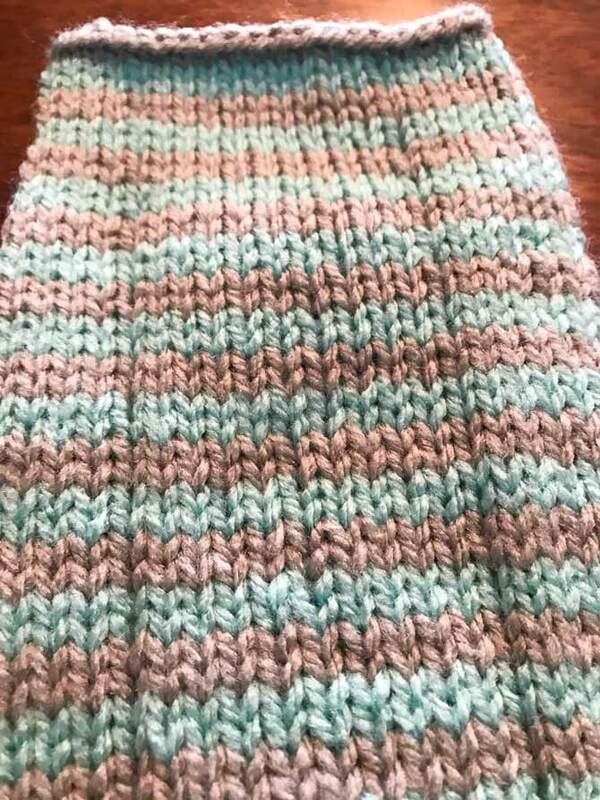 It’s a stockinette stitch pattern and you switch up colors every two rows. If you’re nervous about the color changes, just leave them out and make your first pair all one color. These wristers are the very essence of “potato chip knitting”: you just can’t stop at one pair! Work in progress, everything is striping up nicely! The medium weight of Baby Hugs the pattern calls for works very well with wristers. The yarn stretches to fit over your hands but has the durability that acrylic is known for. One of the most problematic things about wristers is they go over the palms of your hands. Your finger tips are the area that gets the most wear and tear, but second in line are heel and palm of your hands. With this yarn, there’s no pilling or felting, which makes it great for garments that get a lot of wear. Baby Hug yarn comes in 18 colors, so the possibilities for color combinations are almost endless. If you really want to get technical, the number of color combinations is 306, (when you have made all 306 combinations, please send me a picture!) If you knit the pattern with a three color stripe the math gets beyond me. So happy with my Baby Hug Wisters in the colors, Pool and Dolphin! If you’re looking to practice knitting on double pointed needles, give this pattern a try. I remember making it a personal challenge to like double pointed needles. I used to hate them and would use all sorts of interesting methods to get around using them. I bought a set of double pointed needles to help myself learn the technique. If I owned the needles I would have to use them, or my investment would have been a waste. 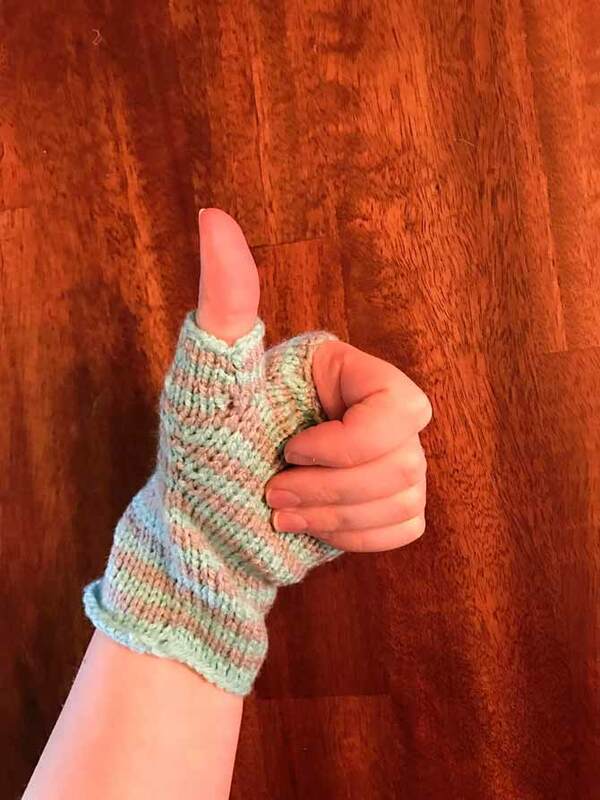 Shaping a thumb gusset is something that is awkward to do on magic loop or two circulars, so I’m glad I took the opportunity to learn a new skill. I’m completely in love with my Baby HugSleek Striped Wristers. 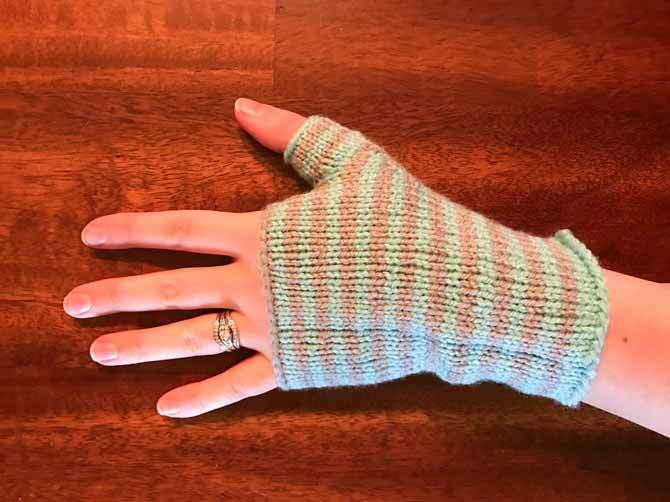 They’re fabulously soft and warm, perfect for when the chill of winter is still in the air, but your fingers can tell spring is coming up fast! Hello Ellen! You can click on any of the links in the article, or follow this one here.